The Physical Impact Rule “ allows a plaintiff to seek damages for negligently caused emotional distress only if the plaintiff can show some physical impact to himself or herself, thus precluding the claims brought by plaintiffs in this case.” This rule was put in place in 1986 after the Saechao v. Matsakoun case in which child siblings witnessed their brother get killed by a motorist. The Court decided the brothers could not recover from damages since they were not physically harmed by the collision. The Physical Impact Rule was overturned in January of 2017 by the Oregon Supreme Court in favor of a test based on the Restatement (Third) of Torts section 48 (2012) for the case of Philibert v. Kluser. Similar to Saechao v. Matsakoun, the case involved two boys who witnessed their younger brother die when getting struck by pickup truck at a crosswalk. For this case, Oregon’s Supreme Court was asked to reject the Physical Impact Rule and adopt a new rule allowing plaintiffs to proceed even if they did not endure physical impact. Negligent Infliction of Emotional Distress (NIED) occurs when a person is injured as a result of a defendant acting carelessly and that person (and potentially a witness of the incident) suffers from mental or emotional damages. Compensation for emotional trauma damages are claimed in most personal injury cases, but the Bystander Rule allows plaintiffs to sue without having incurred physical harm. Additionally, the Zone of Danger rule allows plaintiffs to seek damages amounts if they were close enough to the defendant’s negligence that they were at risk for physical harm. Similar to the Physical Impact Rule, this rule limits a NIED claim to emotional damages based on the fear of an injury. Medical malpractice occurs when a patient is injured through negligence or omission by a physician or other healthcare provider and a claim is filed by the patient or their family. With the Physical Impact Rule overturned by the Oregon Supreme Court, physicians are now at risk for claims from bystanders who witnessed negligent treatment of their family members. Bystanders are able to file medical malpractice claims for damages resulting from emotional trauma even if they did not suffer from physical injuries themselves. 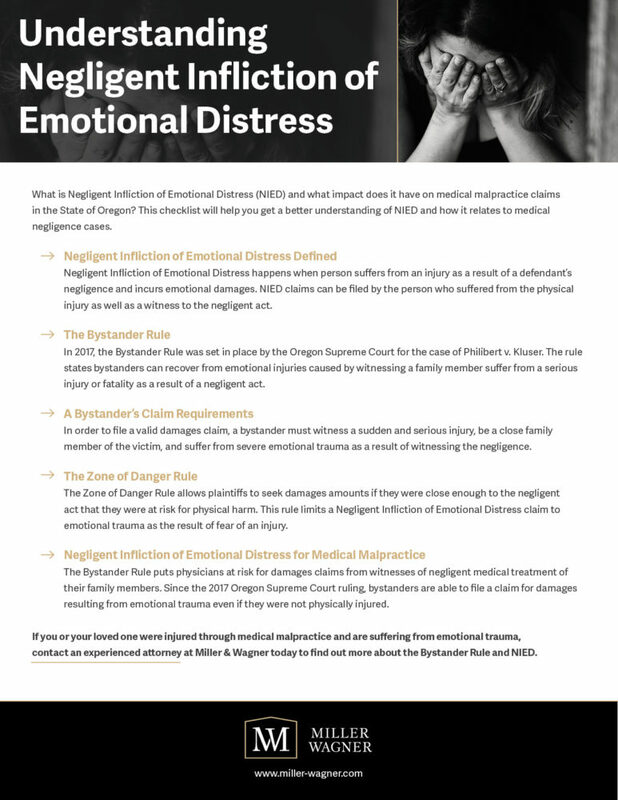 Contact a medical malpractice attorney at Miller & Wagner today to find out more about Negligent Infliction of Emotional Distress and the Bystander Rule. Our experienced lawyers can help you and your loved ones navigate your medical negligence claim.